Spice Hut’s Hottest Hot Sauces! When it comes to heat, we at the Spice Hut know our stuff! That’s why we pride ourselves in carrying some of the best hot sauces we can find. While we usually look at flavor over heat, we do have a few stand outs that will bring you to your knees and make you cry like a baby! Perfect for stocking stuffers and as a gift for those hot sauce lovers! The Scoville scale is a measurement of pungency, the “spicy heat” of all chili peppers. The number of Scoville heat units (SHU) indicates the amount of capsaicin present. Capsaicin is a chemical compound that stimulates chemoreceptornerve endings in the skin, especially the mucous membranes; pure capsaicin has a Scoville rating of 16,000,000 SHU. Naturally, since hot sauces derive their heat from chili peppers, this is the best scale to use to rate the heat of any given hot sauce. So, let’s get started! 1. 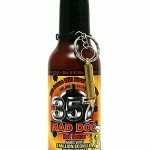 Mad Dog 357 Collector’s Edition- How many times have you signed a waiver before you ate something? With this hot sauce you just might have this experience! Made with a 6 million Scoville pepper extract, this sauce will blow you away! This bottle comes with a bullet-shaped serving spoon that is the suggested serving size for one person. This sauce will bring a tear to your eye, guaranteed! 2. 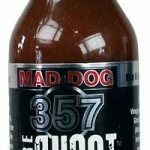 Mad Dog Pure Ghost- This hot sauce uses the hottest naturally occurring pepper as it’s heat source; the Ghost Pepper! No extracts to be found here, only the natural heat of this scary pepper. 3. 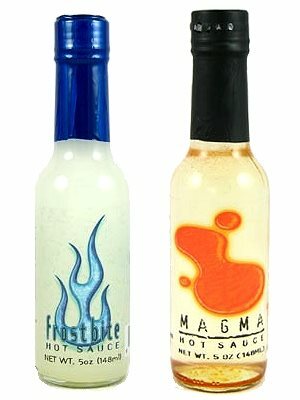 Magma and Frostbite- What these two hot sauces lack in flavor, they make up for in heat! The Magma uses Oleoresin of Capsicum while the Frostbite uses Aquaresin of Capsicum, two powerful extracts that are around 1 million SHU. 4. 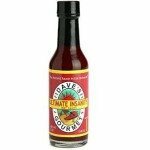 Dave’s Ultimate Insanity-Dave recommends using only one drop at a time and always diluting this sauce in oil or using it in soups or other sauces, its that hot. This hot sauce derives most of its heat from habaneros and pepper extract. Dave rates this sauce as “Insane++”! 5. 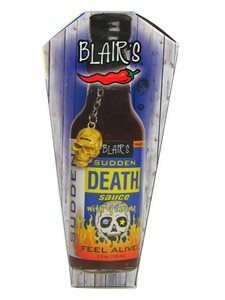 Blair’s Sudden Death- This hot sauce uses ginseng to give you an extra tangy kick in the mouth! Use a “micro-drop” at a time to assess this deadly hot sauce for yourself. Please note, these hot sauces are the real deal. They are all very hot and they are in no particular order, but they should all have well over 100,ooo SHU.